Back in 2013, Gallup’s Well-Being Index named business owners one of the most health-conscious groups in its survey. But, over the course of 2017, Americans’ overall well-being declined, reversing a three-year climb. Business leaders were not immune to this shift, given the demands of their jobs and the toll these take on their mental and physical health. In fact, the American Institute of Stress has reported that stress in the workplace is more strongly correlated with health issues than even financial difficulties or family problems. When you’re first getting your business on its feet, health might be the last thing on your mind; in its place are facts, figures, margins and markets. I know for sure that’s how it was for me. However, just because you’re a busy entrepreneur, your health shouldn’t fall by the wayside. As the health and wellness market continues to grow in the U.S., more companies realize that in order to help their customers live a healthy lifestyle, convenience and ease of use are essential. 1. Soak up your vitamins. Even if you take your daily vitamins, you might only be receiving a fraction of their benefits. Due to a wide variety of factors, the absorption rate of vitamin pills and capsules can vary widely. As some pills only deliver passable results at best, it’s time to look for a new way to get the nutrients you need. Instead of a pill or capsule, you could also try a transdermal patch like the ones from Vitamin Patch Club, a subscription service with products that offer up to 90 percent absorption. Best of all, the patches can be worn at any time and are time-released for optimal results. 2. Test it before you eat it. Awareness of gluten intolerance and sensitivities is growing across the country, and those who struggle with these conditions know all too well what a hassle they can make everyday food and dining experiences. Devices such as the Nima Gluten Sensor aim to change that. When a diner places a morsel of food in the device’s capsule, the connected food sensor will indicate in less than two minutes whether it’s safe to eat. In addition, the device’s connected app offers a social platform for users, allowing them to review restaurants and highlight dishes that are safe to consume. Nima also has a peanut sensor launching soon, which will provide the same service to those who have peanut allergies. The Mayo Clinic advises making your office an active one through a variety of practices, including hourly stretches and walk-and-talk meetings. It also suggests standing during phone calls and chats with coworkers and even using a standing desk. Companies such as VARIDESK are spearheading the standing desk movement, aiming to create an active workspace in lieu of inactive cubicles. VARIDESK’s offerings go beyond just standing desks to include a variety of standing mats, monitor mounts, and active seating. My colleagues love alternating between standing and sitting throughout the day, not to mention that the average employee can burn more calories by just standing for the first half of the day and support their posture in the process. 4. Keep the workout, ditch the shower. Picture it: a hand wipe that simulates a shower. If you want to squeeze in a quick workout between meetings or on your lunch hour, Goodwipes offers a sheet roughly the size of a piece of paper that will enable you to cool down, remove odor and exfoliate in the time it takes for a shower to warm up. The wipes are also biodegradable, and at under $10 for a pack of 10, they’re worth a test drive. 5. Eat a home-cooked meal — even when you think you don’t have time to. 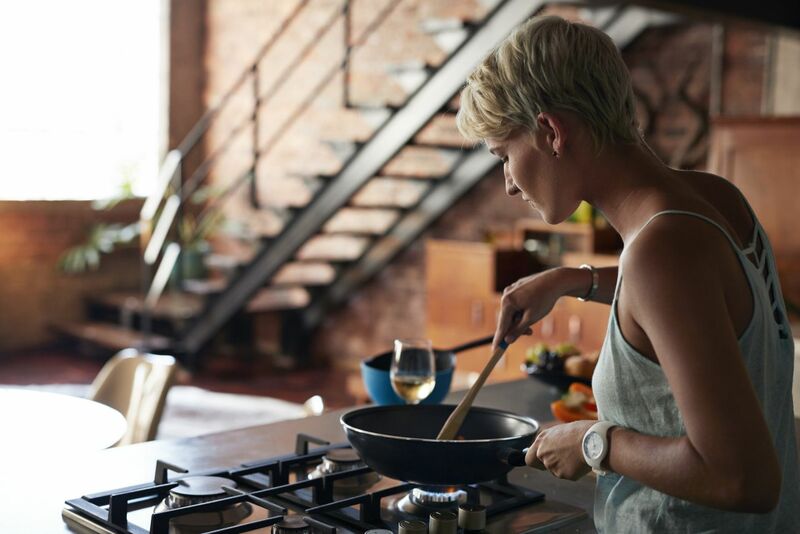 As good as takeout may sound in the moment, psychologists report that cooking at home can actually increase your happiness. When time is in short supply, though, the idea of making a meal from scratch seems daunting. Enter companies such as Blue Apron, the meal kit service you’ve probably heard of but might have yet to try. With plans beginning at around $50 a week, you simply supply the cookware, and Blue Apron provides the rest, down to the two tablespoons of olive oil. When you’re running a company, it’s hard to look past your mile-long to-do list, but these tips make managing your health simple and convenient. With the fast pace of the business world, some things can fade in importance, but thanks to products that are both fast and easy to use, your health doesn’t have to be one of them.